If you're in Australia, signing up and funding your Hashflare account can be a little confusing if you're not familiar with navigating through cryptocurrency purchase processes, especially if this is your first time dabbling with cloud mining. Thankfully, we've investigated the process and have documented the easiest method below. But first, a current introduction to Hashflare from a Hashflare company representative. Once you create your Hashflare account, you will need to verify your account by clicking the link in the email Hashflare have sent you. You can easily setup an Australian account with Coinjar to purchase some Bitcoin (BTC) from funds within your Australian bank account. Using an Australian exchange to do this makes the process easy and offers local support if required. Purchasing some Bitcoin will allow you to purchase your mining contract from Hashflare, as their easiest and fastest method of payment is in Bitcoin. Click on the button below to open a Coinjar account. Once you have purchased some Bitcoin (BTC) and it is sitting inside your Coinjar account, you're ready to start the process of ordering your Hashflare mining contract. The best way to do this is to log back into your Hashflare account, and select Buy Hashrate -> SHA-256. SHA-256 is the name given to Bitcoin mining, because Bitcoin mining uses the SHA-256 algorithm to mine Bitcoins. 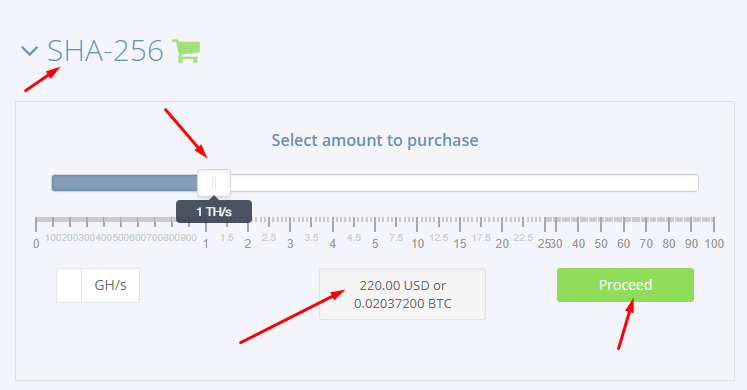 Simply use the slider to indicate how much hashrate (processing power) you wish to purchase. Each TH/s (terahash) or 1000 GH/s (gigahash) costs $220 USD. You can use the calculator below to see how much return you will get for the amount of TH/s you purchase. As a rough guide using a BTC/USD price of $12,000 - 1 TH/s will return $494.37 USD after 1 year. If the Bitcoin price went up to BTC/USD $18,000 - 1TH/s would return $741.56 USD after 1 year. So your returns are based on the value of Bitcoin. 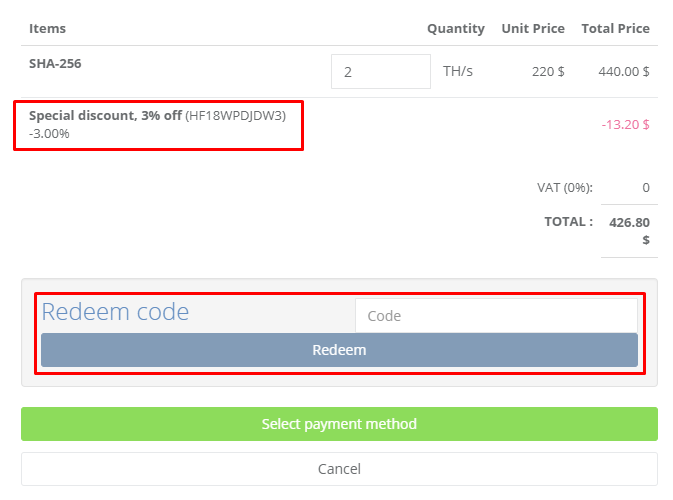 Don't forget to use your DISCOUNT COUPON code to get a 3% discount this January 2018. The next step is to select a payment method. Our research indicates that the fastest payment method is payment via Bitcoin. Although credit card payments are possible, the credit card validation process seems to fail and this require technical support involvement to resolve, which may take some time. Bitcoin payments usually happen within a hour and are error free and automatic. 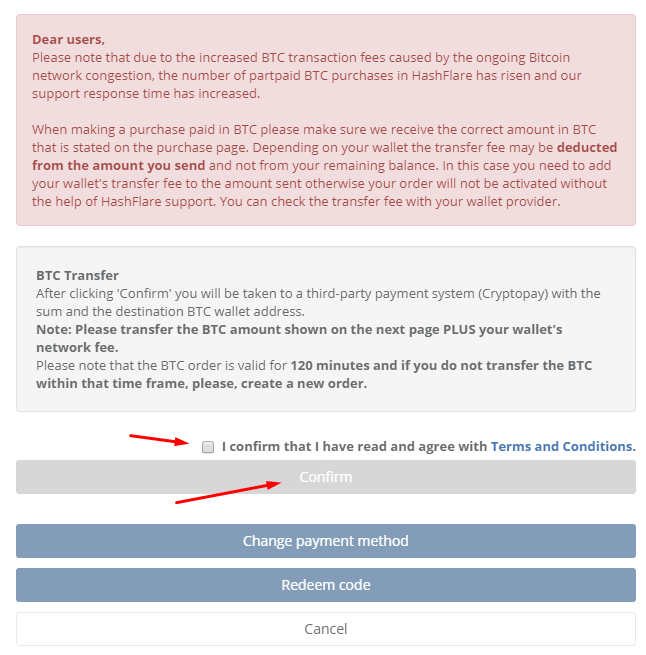 When you elect to pay with BTC a confirmation page is shown with some information about the process. It's good to read this and then confirm you have read the terms and conditions before proceeding to click the Confirm button. 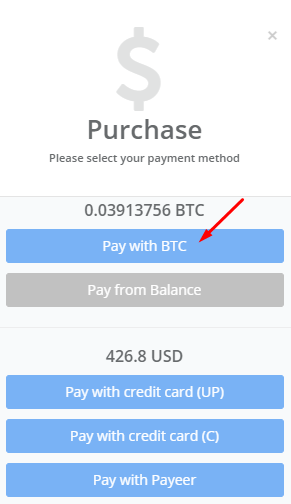 Once the Confirm button is clicked, you will be directed to a page with a BTC payment address. 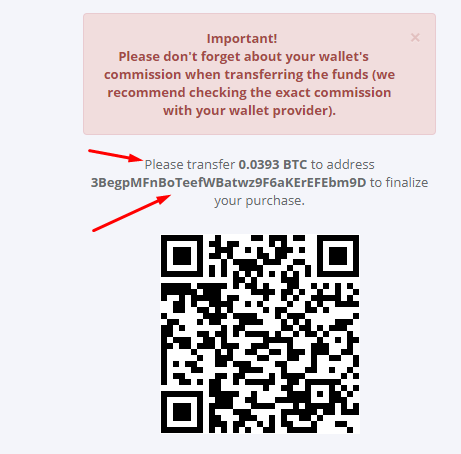 This is the address and the BTC amount you need to send to Hashflare from your Coinjar account. Once your payment is made to the nominated BTC address from Coinjar, it will be sent via the blockchain network to Hashflare, and your mining contract will be activated. This can take up to 2 hours or so, depending on Bitcoin network congestion.